Emerged in France during the 12th century, Gothic architecture is an intricate architectural style that widely spread in Europe during the Middle Ages. The most prominent examples of Gothic architecture are the cathedrals and churches built during that era. The striking Gothic buildings are characterized by featuring cavernous spaces, walls broken up by overlaid tracery, pointed arches and flying buttresses holding the magnificent roofs. This complicated style was commonly used from the 12th century to the 16th century, it signifies the buildings of that era. Here are some of the most iconic examples of Gothic architecture. Thanks to the globally renowned Victor Hugo’s novel The Hunchback of Notre Dame, Notre Dame de Paris is the most famous Gothic building in the world. The magnificent building has been featured in numerous movies, including a beautiful animation movie, and many paintings. Completed in 1260, the cathedral has seen many renovations over the centuries, all of which keeping with the original design. The enormous colorful rose windows and the abundance of sculptures make this cathedral a thing of beauty. The two towers of the Notre-Dame de Paris are 69 meters high. Until the Eiffel Tower was completed in 1889, they were the tallest structures in Paris. One of the most visited tourist attraction in Paris, 12 million people visit Notre-Dame annually, Gothic architecture definitely has its allure! Listed as a UNESCO world heritage site in the year 2000, Mir Castle was built in the 16th century in the Polish Gothic style. Mir is one of the best examples of Gothic architecture in the 16th century, when architects started to let go of the overly ornamented designs. Some even say that its design is a mixture of Gothic, Baroque and Renaissance architecture. The castle is also a great example of 16th-century fortification art. Mir complex includes a spacious park, the castle, a pond and a chapel. The castle currently houses a boutique hotel and a restaurant in the dungeon. Taking almost six centuries to be finished, the construction of Milan Cathedral began in 1386 and was completed in 1865. It is the largest cathedral in Italy, the third largest in Europe and the fourth largest in the world. More than its humongous size, Milan Cathedral is renowned for its intricately ornamented facade and its forest of spires and pinnacles. The giant building is constructed of brick and features a marble facade. The maintenance and repairs of the cathedral are very complicated. That is why its management has launched a campaign offering spires for adoption; which means that a member of the public can have their name engraved on a plaque placed in the spire if they pay for its annual maintenance fees. If you find yourself in Milan, you have to pay a visit to the Milan Cathedral, and take a walk on the roof. It is open for tourists and offers a magic walk through the magical land of spires and statues. Listed as a UNESCO World Heritage Site in 1988, the original cathedral was founded in 597. However, it was completely rebuilt and enlarged at the beginning of the 12th century following a fire in 1174. The Gothic style was adopted for the rebuilding of the cathedral. The renowned Gothic architect William of Sens was called to work on Canterbury Cathedral after it was demolished by the fire. He was given the task of rebuilding and extending the building. Sadly William could not see his work completed as he fell from a scaffold and was seriously injured, he was forced to return to France after his accident. His successor, the architect and stonemason William the Englishman completed the project. 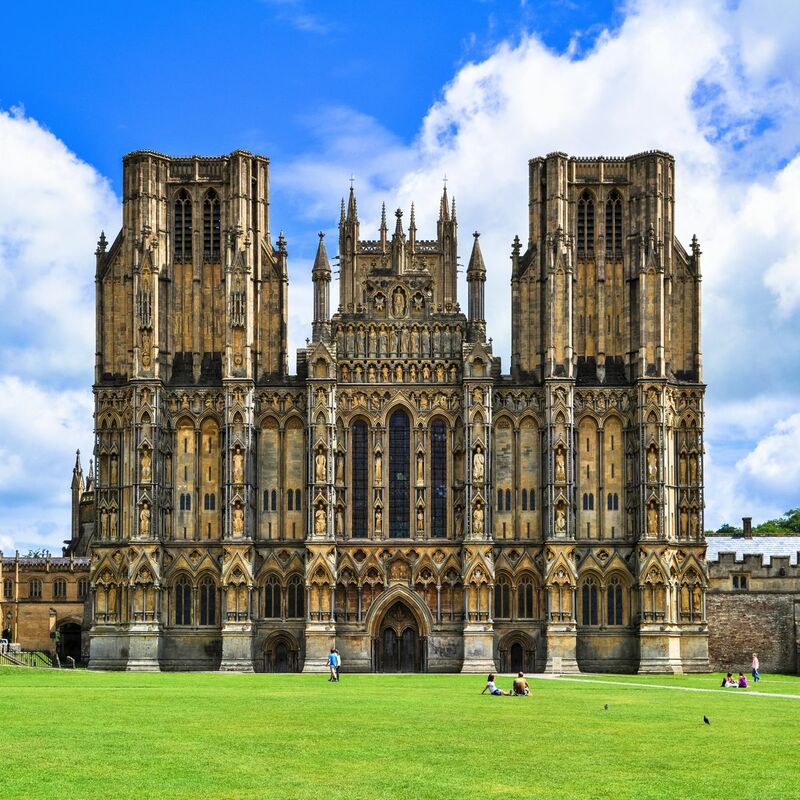 This cathedral is often described as England in Stone as it perfectly exemplifies the rich history of the country. Thanks to “The Canterbury Tales” by Geoffrey Chaucer, the cathedral is very famous among not only architecture lovers but also literature lovers. One of the most outstanding examples of Gothic architecture, St. Vitus is located within Prague Castle. In addition to being the largest religious building in Prague, St. Vitus is where coronations of Czech kings and queens take place. Construction of the famous Gothic Cathedral began in 1344. Nonetheless, it was not completely finished until 1929, 600 years after construction started. Most of the relatively newly built parts are Neo-Gothic style, but it was built in harmony with the original design.